Your logo is a small piece of what represents your brand. A brand goes beyond the visuals of your business. It’s the experience you create for your customers. It can be the joy or relief they feel from doing business with you. It can be the motivation or satisfaction they walk away with after buying something you offered. It’s how they tell their friends, families, and colleagues about you and the services you provide. Your brand is the relationship you have with your audience - it’s how they feel and think about your business. 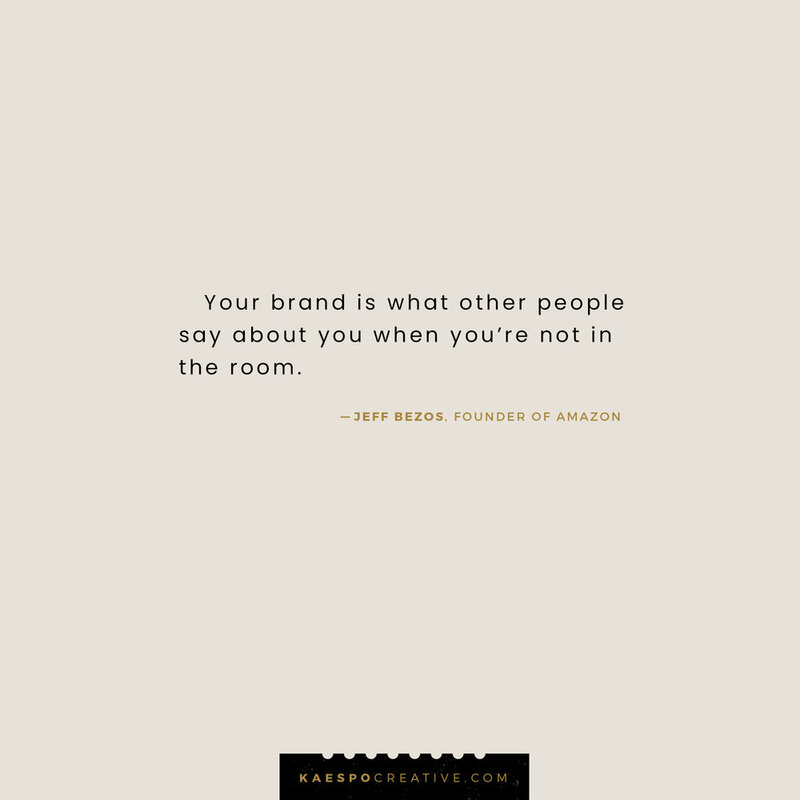 Your branding is the strategy you use to guide those emotions and thoughts. By developing and implementing your brand strategy, you have the opportunity to tell your audience your story in a way that will resonate with them. Do I need to invest in branding? With the definition of your brand in mind, this question becomes simple to answer. Do you want to invest in the way your potential clients perceive you and your current clients talk about you? A strong brand sets you apart from your competitors and by giving your business an identity, you’re able to connect with your ideal audience. Sometimes we pay for services or products simply out of convenience or lack of options in the market. If there’s only one convenience store in your neighbourhood, you’ll likely buy from them because you don’t have time for a 30 minute trip to the local grocery store. But if there are two convenience stores in the same neighbourhood and they both have what you need for the same price, which one would you go to? Would it be the one that you’d be in-and-out of without so much as a genuine smile from the cashier? Or would it be the one where you walk in and they greet you with a wave because they recognize you from last week? Where they’ll ask you how your day was? Where they have a local bulletin supporting community teams and events? I know I’d pick the latter every time. The first is just a business, the second is a brand. Apply your experiences as a consumer to your own business. Why do you choose the products you buy? Why did you buy it from that business and not that other one down the road? Why did you pay more for one service when you might have saved a few bucks if you went with a different person? Do you want people to work with you simply because there’s no one else to work with? Or do you want them to choose you above ten other people because they trust you’ll give them a good experience? I can't afford to pay for a brand designer, can I do it myself? If you are concerned that you can’t afford to pay a graphic designer or marketing specialist for getting your brand started then you should pour yourself a glass of whatever you celebrate with and toast to yourself for being business savvy. By knowing where you are with your business and the budget you’re working with, you’re doing yourself a huge favor. There are so many ways to go about building up your brand and you can do what works for you and what stage you’re at with your business. Not having the budget to hire immediate help does not mean you have to do everything yourself and often, doing it yourself is still not the best option. Take Action: When is the last time you reviewed your business and marketing plan? What are your conversions worth and has your value gone up as a business - enough that you know it’s time to put more work into your audiences’ experience? Stay on top of your business goals and don’t be afraid to either cut costs when needed or invest in appropriate tools. If hiring a designer and marketer is not something you’re considering right now, you’re likely still in the process of establishing your business and getting things off the ground. There are a few things that you can do before diving into a logo and all the visuals. Logos and fonts are so much fun to play with and I absolutely agree with that! But there’s more to creating the visual assets of your brand than simply being artistically inclined and choosing a fun color palette. Often, cheaper logo creators and DIY tutorials do not cover the psychology and business expertise that is required to create strong branding. Marketing professionals and brand designers specialize in taking brand stories and turning them into branding that you can use to grow your business to the next level. They can research your competition and your target market to make informed decisions. Everything from the font they chose to the color they put it on is for a reason. There are a lot of resources out there that can help you learn some of this and it comes down to what your time is worth. If you do want to find a professional to work with, it’s important to shop around to find someone (or a company) that you jive with and understands the field of work you’re in. You might already know a designer but perhaps their experience is with corporate businesses and you need branding for your boho jewelry line – there's nothing wrong with not being the right fit! Take the time to find someone that meets all your requirements (including your budget) and you’ll thank yourself later when the process doesn’t become a chore. Take Action: Use my brand checklist to see how well you understand yours! If you find yourself struggling to answer the questions, take some time to dive into your business to establish clarity with your brand. Give your business justice with strong, consistent branding. In summary, your logo is just a piece of the puzzle. If you’re goal is to start, build, and grow a sustainable business: invest in your branding. Have your begun the branding process for your own business? What are some of the struggles you’re dealing with, overcome, or anticipating when it comes to your brand? For more resources, inspiration, or just to chat, connect with me here: @kaespo (instagram), @kaespodesign (pinterest), @kaespodesign (twitter).